When I first watched the trailer of sonic all stars I was not that impressed. Sure it was pretty but I could not understand what was going on. What was the deal with transforming vehicles? I mean if I am racing I want to concentrate on the track not on my ride. It looked to me then that sonic was a party game. More about having fun with your friends rather than racing at breakneck speed. I did not think that it was my type of game and I let it pass. So when sega gave away all stars this month for free on ps+ I downloaded it just out of curiosity, quite sure that I won't like it that much. After playing about 15 hrs of the game one thing that I can say with certainty is how wrong first impressions can be. So here is the deal. In all stars you play as one of the characters from Sega's classic franchises. Not all games are represented (that would have been impossible) but there is a good cast of characters to choose from. Initially the choice is limited but as you progress through the game you unlock more characters that you can use in events. Who you choose will depend upon a lot of factors. Each character has different attributes. 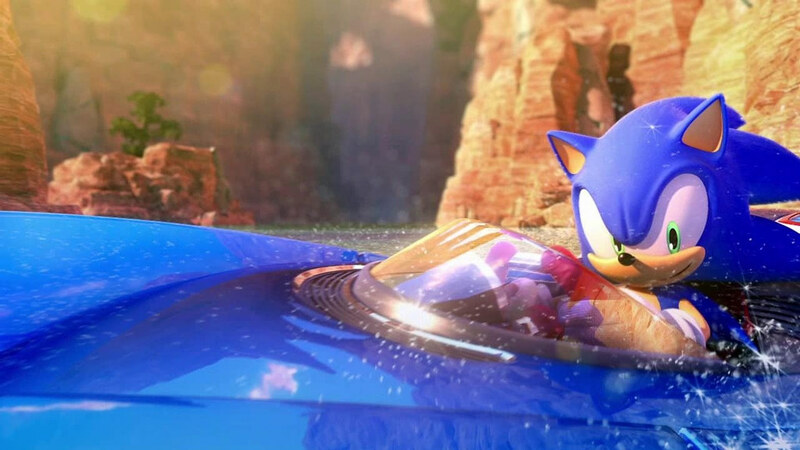 So while sonic has great speed his handling and acceleration can be a bit low. Knuckles on the other hand has low speed but great handling and good boost. So you will have to take into account the layout of the track and the type of event you are participating in while choosing a character. It pays to stick with a single character though. As you complete events with him/her you earn experience. Earn enough and you will unlock an mod. There are six types of mods. Speed, acceleration, boost, handling , super and console. They affect the base stats of the character. A speed mod for instance will increase the speed while it may decrease the value of some other attributes. The super mod is unlocked when you level up a character completely. It usually gives a boost to the highest stat of your character. A super for sonic is super speed while for knuckles it is super handling. The console mod is unlocked by completing the events and earning enough stars in the main tour. The tracks are themed according to the classic stages in sega games. It is astounding how sumo managed to take such a diverse selection of stages form different games and re imagine it to fit it in all stars. The tracks are wide and spacious with plenty of speed pads and power ups scattered around. On each track there are plenty of opportunities to perform stunts that give you a boost if you manage to pull one off successfully. The most interesting things about these tracks are their dynamic nature. As you undertake an event a track slowly starts to change and by the time you enter you final lap a portion of the track might change completely, in a way that it will require effort on your part to adapt yourself to it, in order to maintain the lead. This results in some very intense races. The transformation is not limited to the tracks however. Your vehicles transform as well. On land you have a ride with wheels, on water you have a motor boat and in air you have an air craft. Now some of the vehicle designs are pretty crazy if you ask me. Just look at the air transformation of Ralph's (of wreck it Ralph fame) vehicle. Each transformation is accompanied by a very short animation which can, at first, be a bit jarring but you won't mind them when you get used to it. On a transformation stunt, that is a stunt that has to be performed when you are about to be transformed, you get a massive speed boost. Then there is multiplayer. Here the game maintains a solid frame rate. It has an appreciable amount of people online.There is all the usual stuff that you can expect from it. But I admit that I have spent most of the time with single player. Mostly because I want to get good at the game before I compete against other players (I tired multiplyer before I was ready and was swiftly beaten by much more competent players). For all it's weird and crazy ideas sonic all stars is at it's heart a racing game. You will have to master a track, know by heart all the shortcuts and follow the 'line' of speed pads if you hope to win on higher difficulty levels. You must also master the drift mechanics. Even though the game encourages you to perform drift around every corner I would not recommend it as it comes at the price of lower speed. It is better to follow a straight line and hit one speed pad after the other and drift only when there is a long curve. The weapon power ups won't matter much in a race unless it is the rare all star power up which can completely turn the tables. Yes they are good to slow down you opponents in a neck to neck race but if you rely on them to win you the race well... it won't get you far in the game. Like in any racer you need to be a skillful driver if you want to succeed. While writing this review I feel a sense of Deja vu as it was around this time last year that I reviewed NFS: Most Wanted. I guess part of the reason I did not give sonic the attention that it deserved was because I was occupied by NFS. However after spending a good amount of time with it I can say that sonic all stars is one of the best racers on the vita. Right up there with wipeout and NFS. Don't miss it.